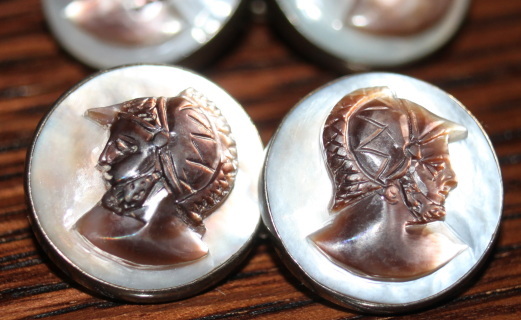 A rare and fine collection of vintage or antique men's cufflinks for sale. 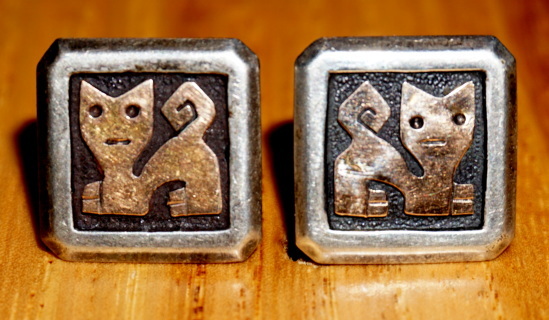 Peruvian 18 karat gold and sterling cat cuff links are inspired by Pre-Columbian motifs, but filtered through the design sensibilities of the artist's Mid-Century contemporaries. They have a cool 1950's modernist look, so they appear ancient and modern at the same time. Entirely hand made, the cats' bodies were cut out of 18 karat yellow or rose gold and applied to the darkly oxidized (deliberately darkened) square silver faces of the links, which makes the golden cats stand out strikingly against the black background. The borders of the links have slightly sloping sides and squared off corners which frame them like a painting and further makes the design pop. 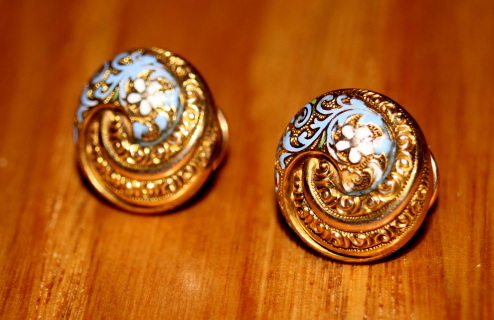 A stunning pair of men's solid 14k gold cuff links with blue, white and lavender enamel work. 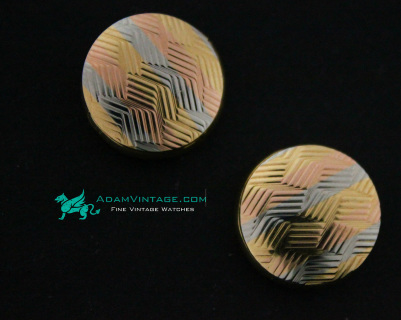 These cufflinks by Camexco Italy are extremely fine; and one of our finest cufflink offerings. The setting is .800 silver with hand carved mother of pearl cameos. The cameos feature a two headed warriors. The settings are very detailed with marcasite accents. The mother of pearl is choice (best) found in nature. The cameos are silvered and a high relief carved mother of pearl intaglio, very detailed. 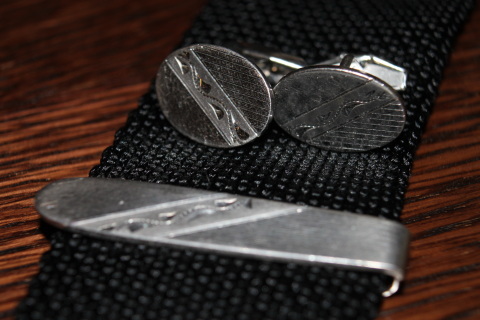 These cufflinks are a very generous and appropriate size approx ¾" x 15/16". We believe the cufflinks are ca.1930's-40's; they have come from an estate sale which contained many pieces of very fine jewelry. Beautiful machined scroll work with diamond cut edges make this set really stand out. Made of solid 925 sterling silver. 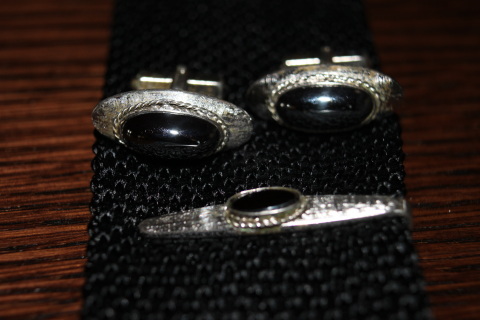 This is a handsome sterling silver vintage 1950s cufflink and tie clip matching set. With very little wear, this set is in near mint condition and has a great classic design. The set is substantial and particularly heavy for its era. 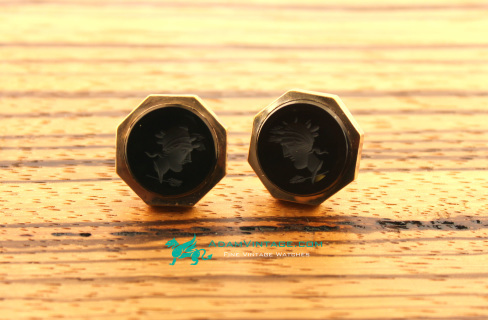 If you're into knights of the round table sort of things, or just like to show off your taste for the eccentric, these cufflinks are just for you. Authentically antique, they have very interesting English hallmarks on the front, on a royal shield design. These cufflinks are solid sterling silver and are nice and heavy. It takes a confident man to pull off floral cufflinks. 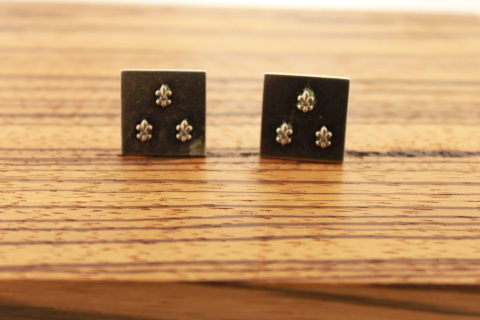 This set is handsomely beautiful with clean lines and a very unusual masculine floral design. Women will be sure to notice your cuffs and tie while wearing this set. If fact, expect many compliments and nods from your female acquaintances. 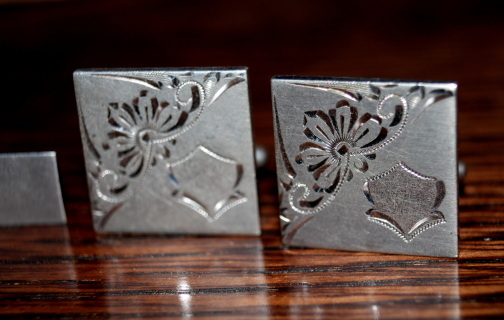 Made in the Victorian era, these cufflinks are in excellent vintage condition showing very little wear. The one piece solid 14k gold construction is in the button style with black enameled design and fine decorative engravings in the center with coined edges. 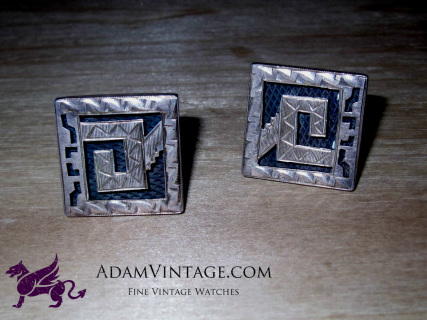 These cufflinks are rare and perfect for the man that demands quality and fine craftsmanship. Please note that the watch shown in the picture is not included in this sale. Well, it doesn't get much nicer than this. 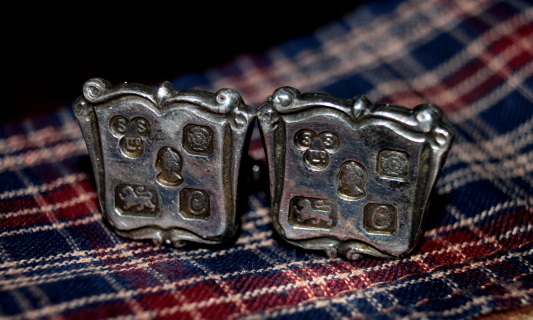 These antique cufflinks are approaching 100 years old and in near perfect condition. Furthermore, the carved mother of pearl is exceptional craftsmanship from this period. 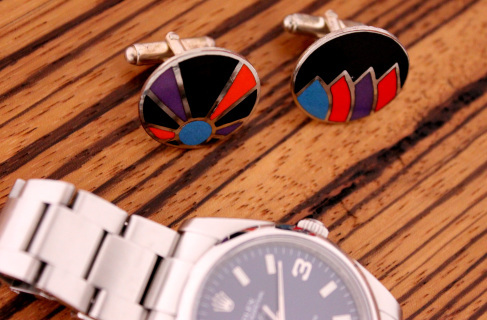 Ready for your cuffs, these fine cufflinks will certainly stand out among the crowd. 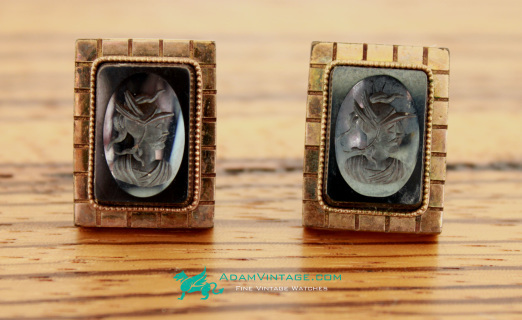 A stunning pair of tiger eye hand carved cuff links from the early 1900s. An absolute steal at this price. These are the coolest cuff links I've had for a long time! Vintage Sterling Silver Enameled Abstract Modernist Men's Cuff Links. These cuff links are in very good condition no flaws to be found. These links are marked 925. and there is a circle with lines through the circle, so we have no idea of the manufacture of these cuff links. The cuff links do come with box just not sure if the links are original to this box, the links have a very unique abstract design. These would have been very difficult to make and are hand made. 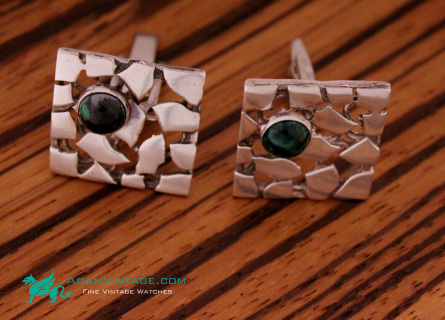 These are just awesome modernistic eccentric cuff links. Watch does not come with cuff links. Great sterling set from the 1970s. This set has a black stone as the center focus, surrounded by a rope design and textured surfaces on all three pieces. Quite nice and in great vintage condition. 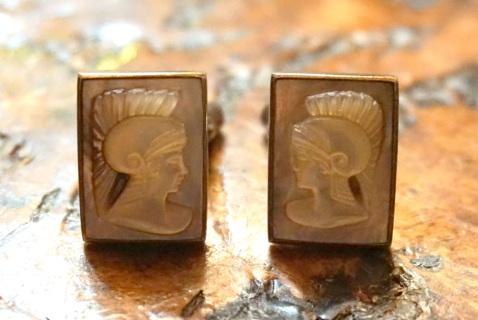 This is an excellent and clean pair of vintage cuff links. Very nice mother-of-pearl specimens carved with relief of roman soldiers. 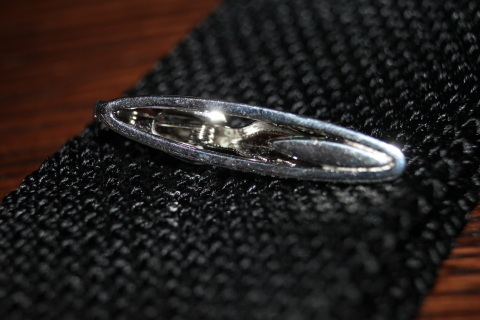 The backings are solid sterling silver and appropriately hallmarked. 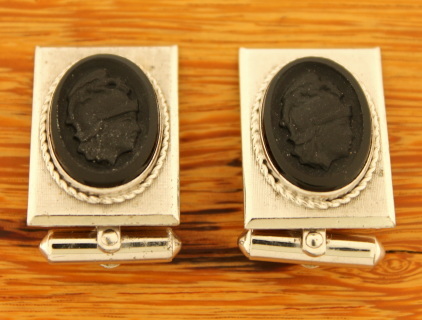 A very nice pare of onyx and sterling cuff links in excellent vintage condition. 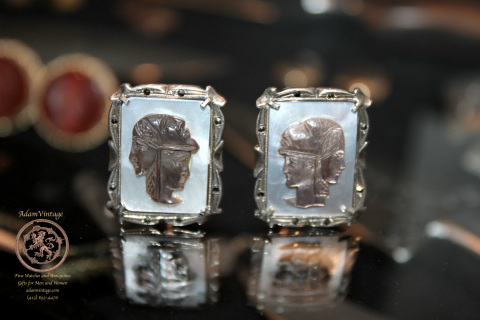 Stunning Men's large Antique cuff links hand carved warriors set in an unusual rose color and white gold filled frames. Stone is Carnelian, a semi-precious gem stone and commonly used for higher end stone carved jewelry of this era. Today, this would be extremely expensive to make. 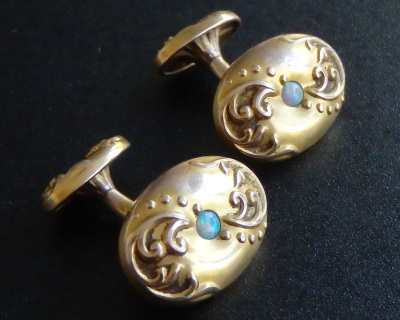 A fantastic pair of solid gold cuff links from the 1920s with a masculine design and nice quality round opals in the center. 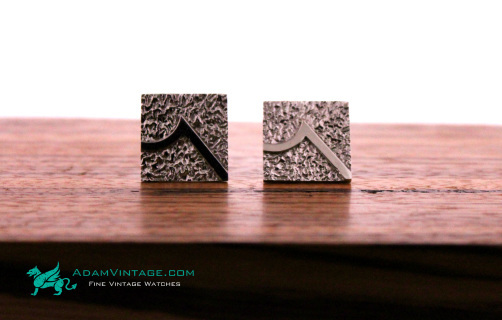 This is a pair of sterling silver cuff links in modernist abstract design from the 1950's. The front is about 13/16 inch (2 cm) square. Patent number 2472958 was issued to inventor Jacob M. Oldak in 1949 for the toggle design. Many different jewelry manufacturers have used this same patent for their cuff links. Marking on the cuff links is "STERLING" and "STER.PAT.2472958". The total weighs is 18 grams. 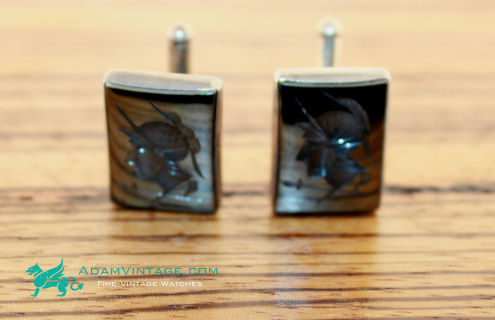 Very stunning cuff links for any occasion. 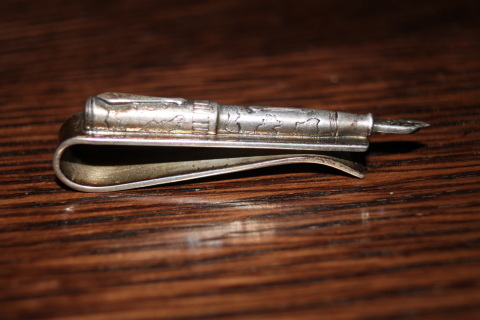 Artist made vintage tie clip with a fountain pen theme in sterling silver measuring approximately 2-1/4"x1/4". Upon examination, it is clear that all the details of this piece were hand worked by the artist. Very unusual, this piece exemplifies the old saying "the pen is mightier than the sword". Very nice even patina that may be easily polished off upon purchase if the new owner wishes it to look new. This piece will be packaged with one of our fine hand-made leather watch pouches. Very modern in design, this is a medium sized clip with a very simple modern design. These are really nice cuff links. The intaglio is carved our of a red material. It's either glass for stone; I cannot tell on these. So I'm pricing them as if they were glass. 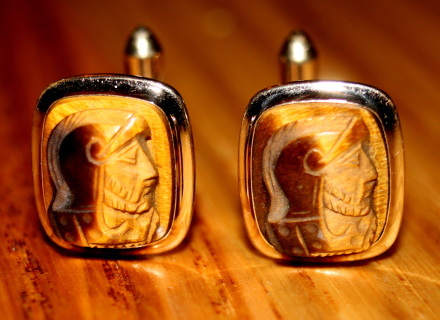 If you're looking fore unique intaglio cuff links; look no more. 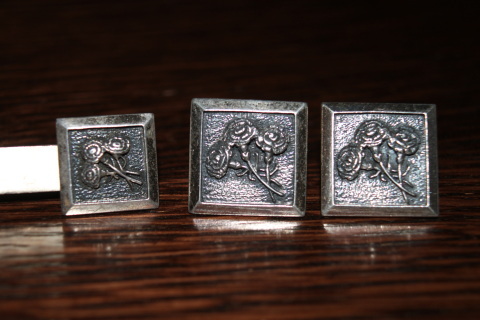 These are very nice solid sterling silver cuff links with hallmarks. The trinity design is classic so they will never go out of style. A great gift or personal purchase. These are a very handsome set of cufflinks. The Intaglios are carved out of a black stone by hand. The stone appears to by onyx; although I cannot guarantee, it also may be a dark soapstone or other type of softer stone in which there are many varieties - but it is stone. The carvings are very well done with the tradition of one warrior being different than the other - look closely. They measure 23mm (larger than average) and have an ellagant celtic design. 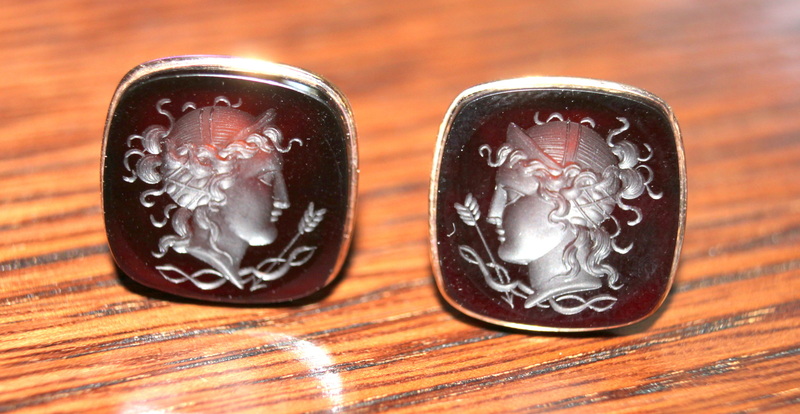 These are a fairly "under the radar" type of cufflinks since the carving is the same color as the rest of the stone. This makes a great gift for the hunter in the family. Or perhaps for someone who love ducks? I would estimate these solid sterling silver cufflinks to be ca. 1970's . 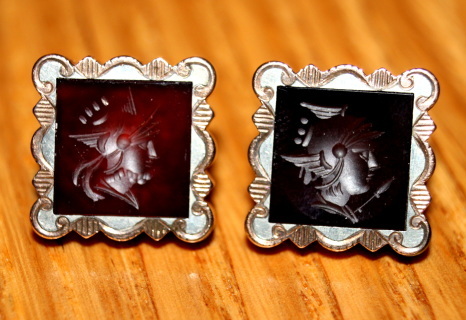 These are very nice quality round vintage cufflinks, featuring carved carnelian (nice bright red color) with the artist depicting 2 different warriors, which is very classic during this era and all the way back to the 1800's. The cufflinks are a large size, at about 25mm in diameter, these won't slip out of your cuff, that's for sure. These cufflinks also features the preferred reverse hinged attachment; as well as a beautiful rope design along the edge. There is very little wear showing under 10x magnification on these 60+ year old vintage men's accessory; and we cannot see any wear to the naked eye.